The report titled “Qatar Logistics and Warehousing Market Outlook to 2023 – By Sea, Land, Air Freight Forwarding; International and Domestic Freight, Integrated, and Contract Logistics Freight Forwarding; By Warehousing (Industrial/ Retail, ICD/CFS, Cold Storage, Others), 3PL Warehousing; By Express Logistics and E-commerce Logistics” provides a comprehensive analysis of Logistics and Warehousing Market in Qatar. 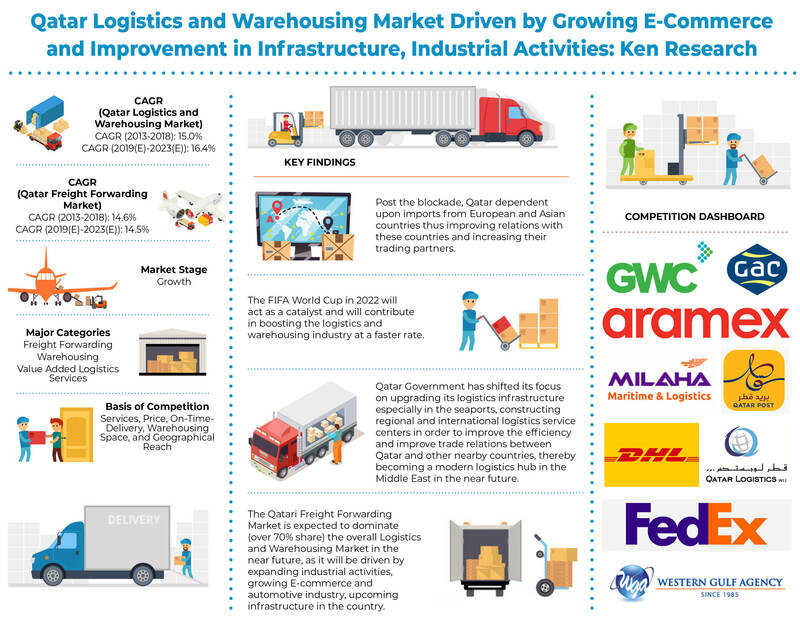 The report also covers the overall competitive landscape and company profiles of major Freight Forwarding, Warehousing, Express Logistics, E-Commerce Logistics, and Outsourced Logistics Companies in Qatar. The report concludes with market projections for future and analyst recommendations highlighting the major opportunities and challenges for the Qatar Logistics and Warehousing Market. Qatar Logistics and Warehousing Market have witnessed robust growth over the past few years owing to the increasing globalization and expanding retail & FMCG market. The country has been observed to massively spend on infrastructure along with the strong performance of oil and gas the sector which led to the growth in logistics and warehousing market. Rising government support to improve trade relations with other countries, improving infrastructure, the introduction of modern technologies, an increasing number of logistics and warehousing service providers have driven the overall revenues of the industry. 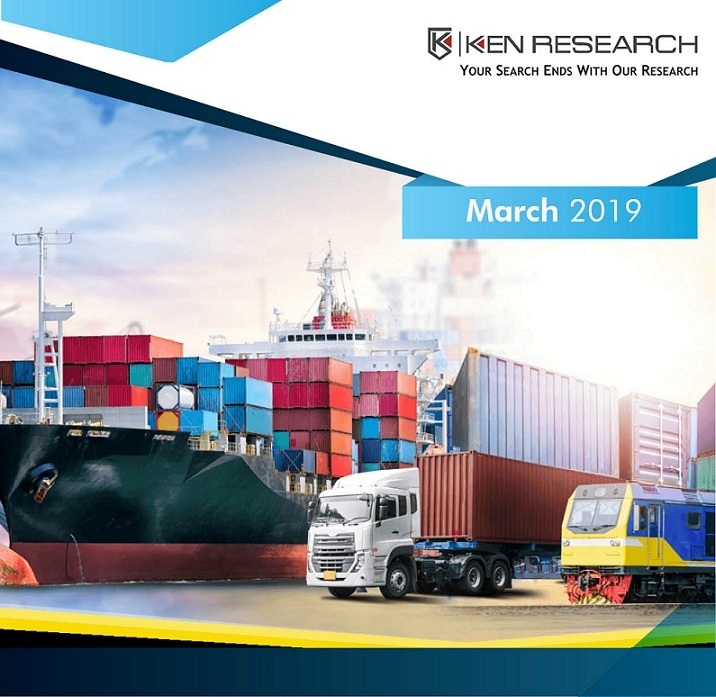 Sea freight was observed to be the most preferred mode of transportation due to the improvement in the infrastructure of ports and relatively cheaper prices as compared to the other modes of transportation; followed by road and air freight. Majority of the imports for Qatar came in from the Kingdom of Saudi Arabia and Dubai. The trucking rates for this are estimated to be QR 3,000 – QR 4,000. On the other hand, for the same amount of freight, the sea freight charges would go up to QR 9,000 and the air freight charges would go even higher. The warehousing landscape in Qatar has been growing rapidly in the past few years. It has become more competitive as more players are entering due to a higher number of opportunities. It is mainly driven by imports and construction materials coming in because of infrastructure development taking place for FIFA World Cup 2022. Qatar has witnessed multiple improvements and innovations in this field, some being the PPP projects awarded by the government. The four companies that had been established include Gulf Warehousing Company (GWC) for Bu Sulba warehousing park, Al Asmakh Real Estate Development for Bu Fesseela, Dohatna Logistics Parks for Umm Shaharaine 1, and Barwa Real Estate Group for Umm Shaharaine. The overall revenue generated by the Express Logistics market grew at a positive double digit CAGR during 2013-2018. The express delivery has grown at a fast pace due to the fast delivery and hi-tech technologies and attracted many international players in the market such as TNT, UPS, DHL, FedEx, and others. The Express Logistics The market in the future is also expected to increase at a similar pace. Consumers of e-commerce are now demanding more convenient methods of collecting their parcels as well as more efficient methods of returns. Majority of the customers prefer to express delivery and this scenario is likely to prevail in the upcoming years, which will result in growth in the market. The overall e-commerce market has increased at a positive double digit CAGR during 2013-2018, which has further provided an impetus to the growth of the Logistics market in the country. Owing to major advances in information and communications technology and its continuously changing landscape, the country has experienced a highly dynamic business environment, with e-commerce becoming more important supporting economic competitiveness and diversification. Qatar’s E-commerce logistics market is poised for strong growth in the coming years. While Qatar’s e-commerce market is not yet fully developed, Qatar has many of the keys ingredients to realize favorable social and economic returns. With the constant advancement in the country’s infrastructure and industry, the logistics procurement habits of Qatar observed major improvement, wherein the companies adopted the third party logistics and although gradual the third party logistics sector in Qatar has observed growth in its market size with time. It has been anticipated that the market will expand in the near future owing to the realization that the domestic companies will have in terms of shifting their focus on core competencies. The competition within Qatar Logistics and Warehousing Market is concentrated in nature with the presence of national and international players such as Aero Freight, Airlink International, Ali Bin Ali, Aramex, Bin Yousef Cargo, Britania Freight and Logistics, CEVA, DHL, Expeditors, FedEx, GAC, Gulf Agency Company, Gulf Warehousing Company, GWC, JSL, Kuehne + Nagel, and many more. Qatar’s expected focus on upgrading its logistics infrastructure especially in the seaports, constructing regional and international logistics service centres, improving the efficiency of connection between Qatar and other countries, thereby becoming a modern logistics hub in near future are few of the major factors that will help the Qatar Logistics and Warehousing Market in the future. The largest trigger of the logistics and warehousing the market, in the long run, will be the development of infrastructure and construction sector owing to the FIFA cup that is to be held in Qatar in 2022.